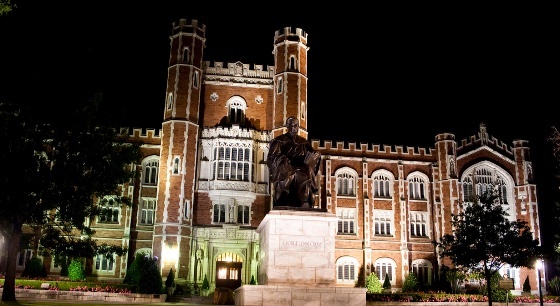 The University of Oklahoma Ranking is 294th in the world on the University Review College Ranking List. It is ranked as the 106th best college in the states by the USnews, and the 202nd best by Forbes. 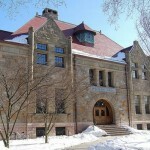 US colleges with similar world rankings to Oklahoma are Northeastern University, Oregon State University, Clemson University, and Wayne State University. The University of Oklahoma tuition fees are $7,695 for in-state and $20,469 for out of state students. It is a moderately selective college accepting 80.4% of applicants. Financial aid offered totals $59 million per year, an average of $16,360 per student. SAT scores for admission requirements (25th-75th percentile) are Math 540 – 650, and Reading 510 – 650. The total (double) composite SAT Score range for accepted applicants is 1030 to 1280. The requirements for ACT (25th-75th percentile) are Composite 23 – 29, English 22 – 30, and Math 23 – 28. The University of Oklahoma, or OU, is a public coeducational university and research facility established in 1890. The Princeton Review included the university in America’s top ten public universities in terms of cost and academic excellence. Its Honors College is considered amongst the biggest honors programs among all US public universities. University of Oklahoma photograph by Billy Adams. George Washington Steele, the Oklahoma Territory governor urged legislature to establish universities of higher learning and public school systems. The university, which was then called Normal Territorial University, was renamed as the University of Oklahoma in 1907 when the state joined the union. The Norman community donated 407 acres in land for the university’s use. David Ross Boyd served as its first president. The university formally opened its doors to students in August 1892. The University of Oklahoma’s original one-building campus was razed by a fire on the 6th of January, 1903. With suggestions from Vernon Louise Parrington, an English professor, the campus was redeveloped. One of Parrington’s suggestions, the North Oval, is now one of the university’s most distinctive features. The University of Oklahoma has fifteen colleges, which include the College of Arts and Sciences, The Price College of Business, the College of Engineering, College of Education, Gaylord College of Journalism and Mass Communication, College of Architecture, College of Atmospheric and Geographic Sciences, College of Earth and Energy, College of Law and the Weitzenhoffer Family College of Fine Arts. University of Oklahoma has two campuses, the Norman Campus and the Health Sciences Center. The Norman campus is further divided into the north, main and south campuses, with the three sections connected by a student-funded bus service. 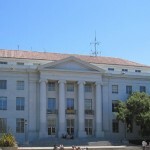 The Health Sciences Center, founded in the 20th century, is one of four educational health centers found in America, and has 7 professional colleges. The campus has several clinical and bio-medical research facilities, with some projects funded by renowned institutions in coordination with the university.